The premiere performances were held on June 1, 2015 at the Gemeindezentrums in Frankfurt am Main, and June 4 at the Große Halle in Stuttgart. The Hazzan/soloist was Hazzan Daniel Kempin, the well known singer of Yiddish repertoire who is Cantor of the Egalitarian Minyan of Frankfurt, ordained in 2015 as Hazzan through the ALEPH Cantorial Program. The Interfaith Choir of Frankfurt was founded in 2012 with the goal of opening new avenues of interfaith dialogue through music. Led by Protestant Church Cantor (organist and choir director) Bettina Strübel and Hazzan Daniel Kempin, the all-volunteer choir presents two psalm projects each year. Each concert is a program of multiple settings of one Psalm from different faith traditions. This year Psalm 90 — תְּפִלָּה לְמֹשֶׁה אִישׁ הָאֱלֹהִים A prayer of Moses, the man of God —was the featured psalm. Psalms are an important bridge between Judaism and Christianity. For centuries musicians of both religions have created a wealth of new musical settings for liturgical use as well as for the concert stage. 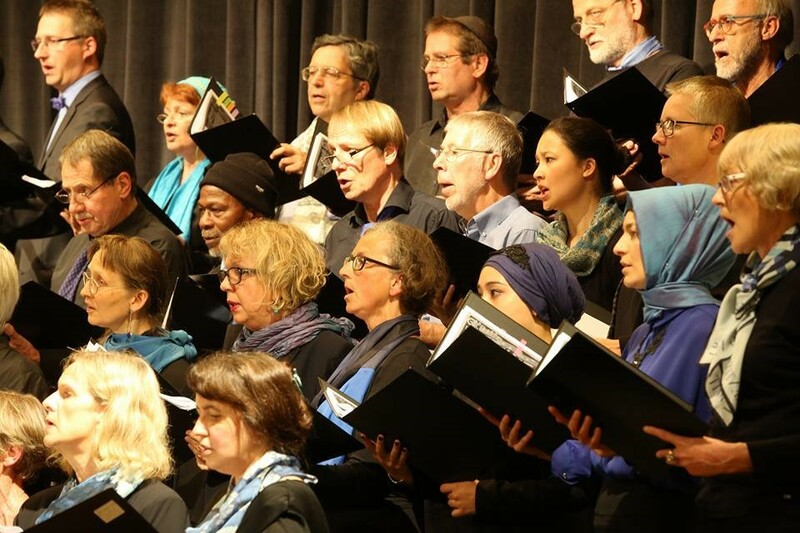 The choir has also attracted Muslim singers, who know the book of Psalms as “az-Zabur.” Rehearsals as well as concerts offer a platform for intensive interfaith exploration of music and theology. During the concerts music is interspersed with interfaith podium discussions on the featured psalm. “Your composition was the highlight of the program. Some of the chorus members have expressed sadness that the Psalm 90 project is over, as they loved rehearsing this piece. The audience responded with tremendous enthusiasm,” said Bettina Strübel, director of the Interrelgioser Chor (pictured right). Hazzan Jack Kessler was ordained at the Jewish Theological Seminary of America, and went on to have a twenty-year congregational career. He has a Master’s degree in voice from Boston Conservatory and pursued studies in composition in the graduate department of Brandeis University. A lyric baritone, he has performed opera, oratorio, and premiered new works, in addition to his ongoing career as a singer of hazzanut, the cantorial art, and other musical projects. He directs the Cantorial Program of ALEPH: Alliance for Jewish Renewal for which he teaches the multi-year core hazzanut curriculum and coaches students in the cantorial art. A copy of the piece is available in pdf form by contacting Hazzan Kessler at alephcantorial@comcast.net. Choirs who might be interested in American performances of this piece can contact Hazzan Kessler. Posted in General Interest and tagged cantorial program, Germany, Hazzan Jack Kessler, psalms. Bookmark the permalink.